Cheetah Tool Free Version is a small application for windows computer created by Cheetah Tool Developers, which allows you to remove or bypass the FRP Protection from your Samsung Smartphones very quickly with its simple and user-friendly interface. The several features of Cheetah Tool Free Version includes FRP Reset Tool, Reset Phone Lock, Reset Screen Lock, Factory Reset, Language Enabler, ADB FRP Tool and many more. 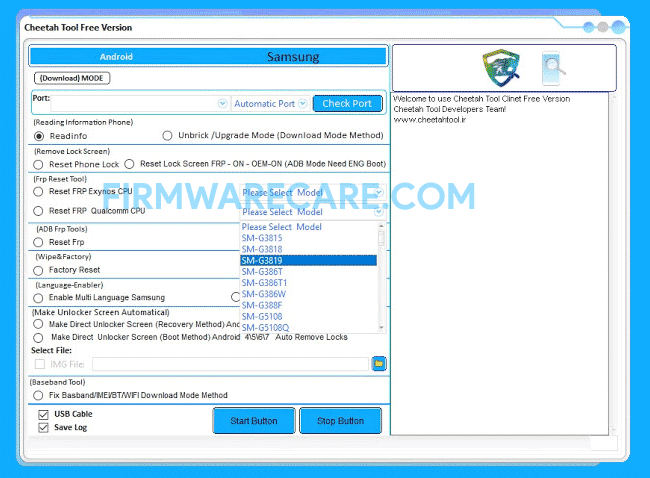 FRP Reset tool comes with two option: Reset FRP Exynos CPU and Reset FRP Qualcomm CPU. By using Cheetah Tool Free Version, you can easily remove FRP protection from your Samsung devices running on Exynos and Qualcomm chipset. It supports almost every model of Samsung including SM-G3816 / G3818 / G3819 / G386T / G386T1 / G386W / G388F / G5108 and G5108Q. In order to use the Cheetah Tool, you need to install the Universal ADB Driver on your computer. [*] Compatibility: The Cheetah Application runs perfectly on Windows XP, Windows Vista, Windows 7, Windows 8, Windows 8.1 and Windows 10 (32 bit and 64 bit). [*] Credits: Cheetah Tool is created and distributed by Cheetah Tool Developers (developer). So, full credits goes to Cheetah Tool Developers (developer) for sharing the tool for free.